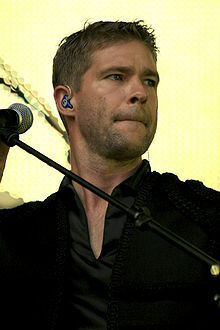 Søren Nystrøm Rasted (born Søren Rasted on 13 June 1969 in Blovstrød, Denmark) is a Danish musician, singer, songwriter and record producer. He plays keyboard, guitar and sings backing vocals. He is one of the four members of Danish eurodance group Aqua, and was married to the Aqua vocalist Lene Nystrøm. Rasted and Claus Norreen were voted, in the US, two of the ten best pop songwriters/producers who have ever come out of the Scandinavian pop scene. On 25 August 2001, Rasted married fellow Aqua band member Lene Nystrøm, with the ceremony being held in Las Vegas. In 2004 the couple moved to Denmark from London. Together, they have a daughter, India, and a son, Billy. Rasted was a member of the Danish pop-dance group Aqua. He and his fellow band member Claus wrote and produced the three Aqua albums Aquarium, Aquarius and Megalomania. Aqua was formed in 1994 and split up in 2001, but reunited in 2008. The band sold more than 28 million records worldwide, and appeared in the Guinness Book of Records as the only debut band with three "self penned" Number One hits in the UK. In 2004 Rasted released the spoken word album Lazyboy TV under the name Lazyboy. The album included the singles "Facts of Life", "Inhale Positivity" and "Underwear Goes Inside the Pants". Rasted has worked as producer and songwriters on various Danish artists such as Sort Sol writing their "Holler High". Rasted also worked with Jon on "Right Here Next to You" and "This Side Up". He also wrote the single "Teardrops in Heaven" for Sanne Salomonsen, The single "Det bedste til sidst" for X-Factor winner Linda, and the single for Mathias Pachler "Mit Et & Alt". In 2006 Rasted wrote and arranged music for "Det Kgl Teater", the music for the Royal Danish Opera ballet American Mixtures. Rasted is a member of the Danish band Hej Matematik. He has also made various TV scores and film scores. In 2009 Rasted produced the Aqua songs for the "Best of" album: "Back to the 80's", "Live Fast - Die Young" and "My Mamma Said". in 2011 Rasted wrote and produced with Claus Norreen, Rene Dif and Lene Nystrøm the Aqua album "MEGALOMANIA". In 2012 Rasted started the Label "LabelLand" distributed by ArtPeople. In 2012 Rasted and Nicolaj Rasted did the songs and the score music for the Jonatan Spang movie "Talenttyven". In 2012 Rasted recorded the first Lazyboy track in 7 years, "2012 Shift Happens". 2011 How R U Doin'? ^ "Today in history". The New York Times. Associated Press. 13 June 2014. Retrieved 14 June 2014. ^ "Lene Nystrøm og Søren Rasted: - - Begge sitter trygt og godt i det for resten av livet". Se & Hør. 27 April 2017. Retrieved 1 September 2017. Wikimedia Commons has media related to Søren Rasted. Mattel, Inc. v. MCA Records, Inc.